New Video Added. On their return from the Xmas lunch last week a diehard group of Geezers headed off to the Eleanor Arms on Old Ford Road for a few more beers. Here they encountered a choir from St Paul’s Church nearby. In the short video below, kindly sent to us by Sarah Gilbert, you can see the vicar, Rev. James Hughesdon, and the locals joining in with the carols and having a great time. The video below is from Craig Richards who filmed, clockwise from the bottom, Ray Gipson, Don Tomlin, Ricky Ayliffe and Barry Stradling trying their best! On Christmas Eve St Paul’s Old Ford Church (St Stephen’s Rd, London, E3 5JL) is holding a Midnight Mass starting at 11pm. All welcome. There’s also a Morning Service on Christmas Eve at 10.30am, and a children’s Service at 4pm. On Christmas Day there’s a service at 10.30am. Footprints of London is a tour guides’ co-operative which runs hundreds of different guided walks around London. They’re offering a gift voucher for two people for £20, which is valid on any tour during next year. Details here. The Arts and Crafts market in Greenwich is open until 8pm on Weds. The Water Rats Theatre at Kings Cross are holding: “London’s most adorable all-singing, high-kicking, joke-telling, burlesque-dancing, Dubonnet and gin-drinking immersive 1930s night out – PUTTIN’ ON THE RATZ!” Booking early is essential to get into this one. 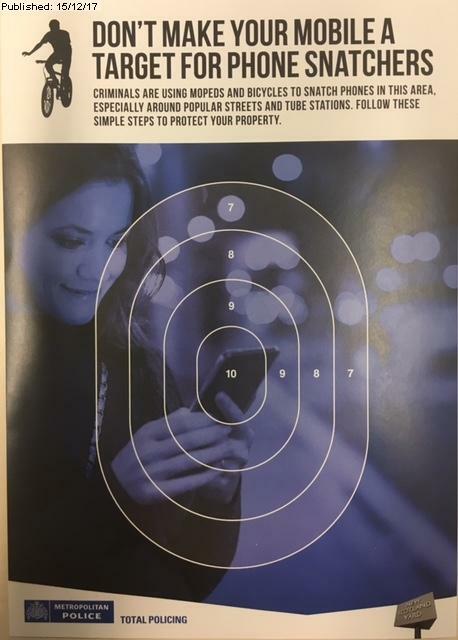 The Met Police were recently handing out these warning leaflets outside Mile End Station, one of the places where phone snatching has been happening.